I was greatly saddened to learn today of the death of the conductor Sir Edward Downes, who died together with his wife in a Swiss clinic on July 10th. Ted Downes was a fine and underrated conductor who worked with many orchestras; most notably with the BBC Philharmonic, with which he enjoyed an association lasting forty years . He was also a fine opera conductor and a passionate champion of Verdi, saying about the composer "I seemed to understand Verdi as a person. He was a peasant. He had one foot in heaven and one on the earth. And this is why he appeals to all classes of people, from those who know everything about music to those who are hearing it for the first time." 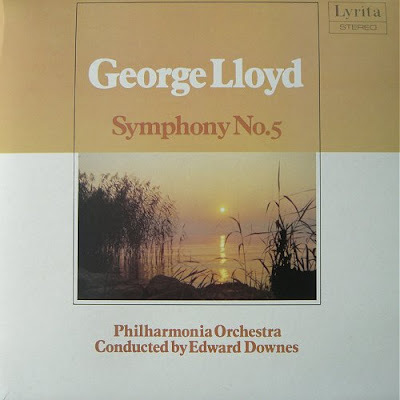 Among the treasures in my record collection are Ted Downes' pioneering recordings for Lyrita of the symphonies of George Lloyd (1913-1998), a 20th century composer whose distinctive music took its inspiration from Verdi and Berlioz rather than from fashionable peers. My LP of George Lloyd's Fifth Symphony (seen above) plays as I write. Peter Maxwell Davies and Malcolm Arnold were among other composers championed by Edward Downes. One of his many strengths was that he not afraid to swim against the musical tide. He shared this attribute with two other great conductors who we have lost recently, Richard Hickox and Vernon Handley. We cannot afford to lose many more like them. I am reminded that Ted Downes started his career as a horn player and was in the orchestra for the first performance of Peter Grimes under Reginald Goodall at Sadlers Wells in June 1945.